MONTGOMERY – The owner of LAF, which rents gigantic board game pieces for children’s parties and adult gatherings, is launching a second business April 4 on the one-year anniversary of his first business. Julian Petty’s new venture is work|SHOP, which may be the only business in the state to combine pop-up retail space with both shared office work space, private offices and office suites. The location – 5027 Mercer St. in the Hampstead development in East Montgomery – could not be more desirable. The front of the building is dedicated to small business owners selling merchandise by renting wall space, rack space or table space. offices to hang their work. 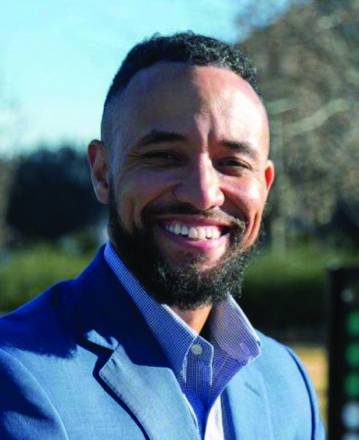 He has scheduled several business owners for “Empowered Speaker Series” and plans to hold networking meet-and-greet events called “Meat and Treat” with business sponsorships. Petty wants individuals to pitch their business ideas to other clients in the building 9 a.m.-10 a.m. Tuesdays and Thursdays. “You invite people and we boost it on our website and we set it up for you,” Petty said. Office space may be rented daily, weekly or monthly, but for a $350 monthly membership fee, clients receive 10 tokens used for the various spaces in the building. “The tokens allow you to be flexible,” Petty said, referring to use of the conference room or private office or sound room or storefront space, etc. Work|SHOP has curbside parking and because it’s located at Hampstead there are restaurants within walking distance, a library and YMCA. Another benefit at 5027 Mercer St. – it’s a designated pick-up and delivery spot for Jim Massey’s Cleaners at no additional charge. Petty, who is active-duty Army and currently working on a master’s degree at Auburn University at Montgomery, said that “there is a reason behind” his business concept and that is to take care of his mother, Johanna Petty. “She was always there for her sons. She has struggled all her life – like all her life,” he said. “I started this (work|SHOP) and she’s going to run it. And she is going to own it. I’m going to sell her both businesses and I’m going to move her up here. She had to do everything on her own as a single parent. We didn’t have the best of resources growing up, but somehow we (younger brother Ryan) prevailed through family and prayer. We’ve done pretty well for ourselves. For nonmembers, the building is open seven days a week: 7 a.m.-8 p.m. Monday-Friday and 9 a.m.-3 p.m. Saturday and Sunday. For information, visit the website: www.workorshop.com.